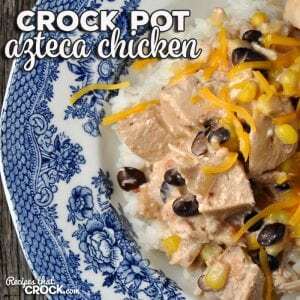 Crock Pot Azteca Chicken - Recipes That Crock! Oh my folks! Do I have a treat for you?! 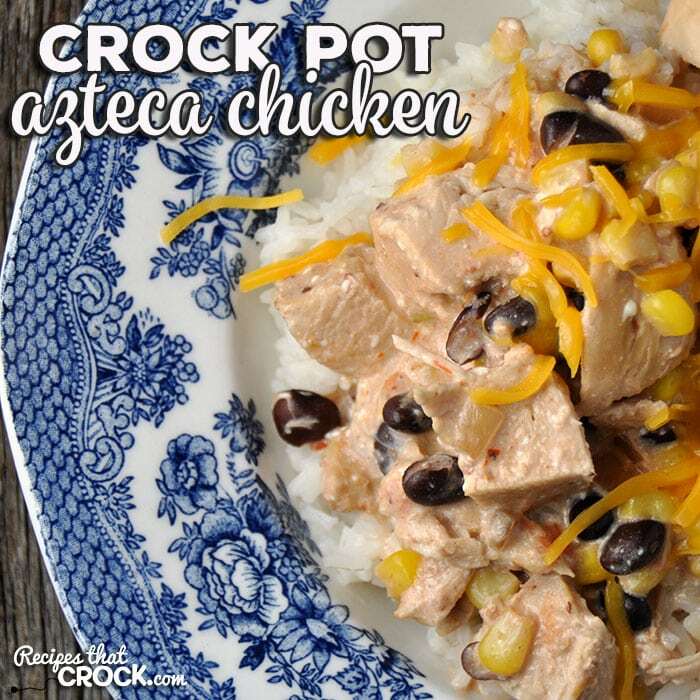 This Crock Pot Azteca Chicken is going to immediately show up on your go-to recipe list! 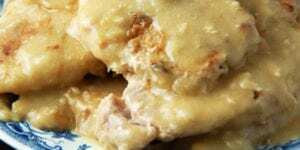 It is easy and delicious! 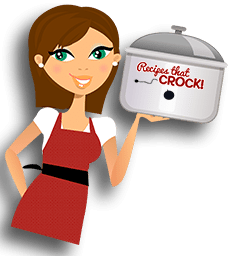 When Cris showed me this yummy Crock Pot Azteca Chicken in Crock Pot’s Mexican Slow Cooking (look for it in the grocery aisles at Wal-Mart), I knew I wanted to make it, but I had NO idea how amazing it was going to be! And talk about simple! 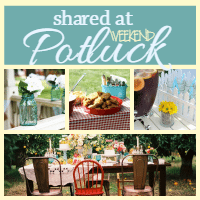 You can seriously throw this together in just a few minutes. And the flavor…everyone is gonna flip over this! 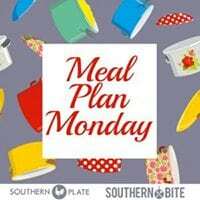 Pour your beans (already drained and rinsed), corn and 1/2 cup of salsa into your 4-quart crock pot and stir until well combined. Place your chicken breasts on top. Pour your remaining 1/2 cup of salsa all over your chicken. Cover and cook on low for 4-6 hours or high for 2-3 hours. 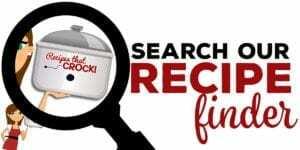 Once your chicken is done, remove it from your crock pot and cut into 1 inch pieces and put it back in your crock pot. Add in your cubed cream cheese, stir. Cover and cook on high for 15-20 minutes, stirring if it looks like it needs it, until the cream cheese is melted into the sauce. 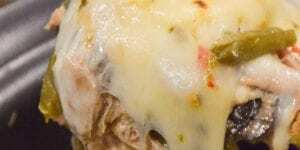 Serve chicken and sauce over rice and top with shredded cheddar cheese, if desired. When you make this and look in after it has been cooking for a while, it is going to look like there is a LOT of sauce. That’s a good thing! Trust me, this sauce is amazing over the rice, so don’t fret that it looks like there might be too much sauce for the chicken. 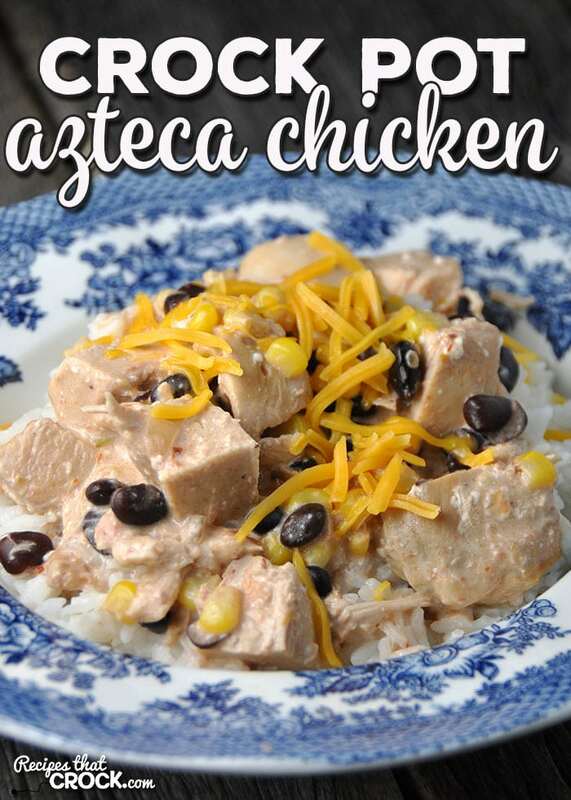 This Crock Pot Azteca Chicken is going to immediately show up on your go-to recipe list! 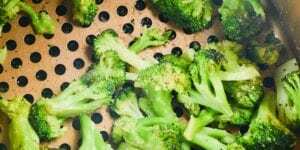 It is easy and delicious! Pour your beans (already rinsed and drained), corn, garlic, cumin and 1/2 cup of salsa into your 4-quart crock pot and stir until well combined. I think I would prefer to modify so that I don’t have to use uncooked chicken. This sounds wonderful. If I would want to double, should I use 16oz cream cheese? Sounds like a lot to me. Thank you for your kind words! 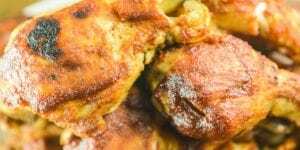 I haven’t tried doubling it, but if you are doubling the rest of the ingredients, I would double the cream cheese as well to achieve the same taste and texture of the original recipe. 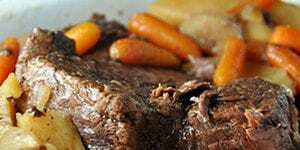 I would also use a larger slow cooker and watch it closely the first time to make sure you get the timing right. I hope you enjoy it as much as we do!